A Maryland native, Booth was born into one of the country’s leading families of actors. He was well known at Ford’s Theatre. On the night of April 14, he was welcomed as he passed up the stairs to the president’s box. From Frank Leslie’s Illustrated Newspaper, April 29, 1865. 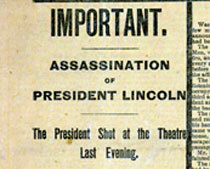 Courtesy of the Abraham Lincoln Presidential Library and Museum. On April 14, 1865, the Lincolns and their two guests, Clara Harris and Maj. Henry Rathbone, arrived late to Ford’s Theatre for a production of Our American Cousin. As the president entered the theater, the crowd wildly cheered and the orchestra played “Hail to the Chief.” Lincoln set his silk hat on the floor, and the actors resumed where they had left off. At about 10:15 p.m., John Wilkes Booth entered the presidential box, pointed a derringer pistol at the back of the president’s head and fired. Booth then pulled out a knife, slashed Rathbone, and jumped onto the stage, declaring “Sic semper tyrannis”—“Thus always to tyrants,” the Virginia state motto. Despite breaking his leg as he hit the stage, Booth escaped backstage and onto a waiting horse. "The shouts, groans, curses, smashing of seats, screams of women, shuffling of feet and cries of terror created a pandemonium that . . . through all the ages will stand out in my memory as the hell of hells." The play’s leading actress, Laura Keene, rushed with water to the president’s box. As she cradled the president’s head, drops of his blood stained her cuff. She gave the cuff to her nephew, M. J. Adler, who preserved it throughout his life. On April 15, Surgeon General Joseph K. Barnes directed an autopsy on Lincoln’s body in the White House. The name of the surgeon who performed the autopsy was not recorded. 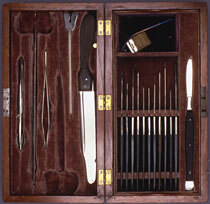 The instruments he used were given to Alfred D. Wilson, a young doctor who assisted in the procedure. They remained in Wilson’s family until they were donated to the Medical Society of the County of Kings in Brooklyn, New York, in 1935. 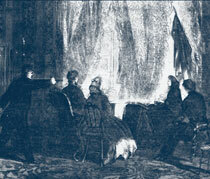 Death of Lincoln, painted and engraved by A. H. Ritchie, about 1875. Courtesy of the Library of Congress.